In 1967, Pierre Le Vec and Pierre Moulin opened a shop in Greenwich Village in NYC with the intent of bringing the beauty of French Country decor to America. 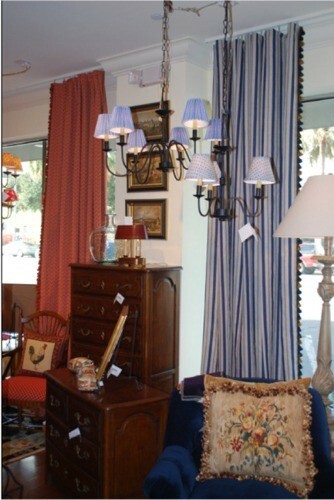 They quickly discovered that the curtains, pillows and fabrics they used to accent the furniture sold spectacularly. Over time, the business evolved to include décor for every room in the house. Presently, Pierre Deux is a growing national chain of retail stores that continue that original focus. Their company is experiencing strong growth and new retail stores have been opening regularly throughout the US. Curtain-Tracks.com was approached by the architects and designers contracted to assist in creating the look of these new stores. By understanding how the required curtain tracks would be used, our technical support team aided in the selection of the RECMAR 3120 track and 7140 wheeled carriers based on its appearance, functionality, and durability. This track was evaluated by the designers and selected as the perfect solution for Pierre Deux’s needs. As a result, Curtain-Tracks.com has supplied drapery hardware for numerous recent store build outs including Chicago, Houston, Fairfax, VA, Charleston, SC, Princeton, NJ, and Manhasset, NY. The track is used for two primary functions in these retail settings. 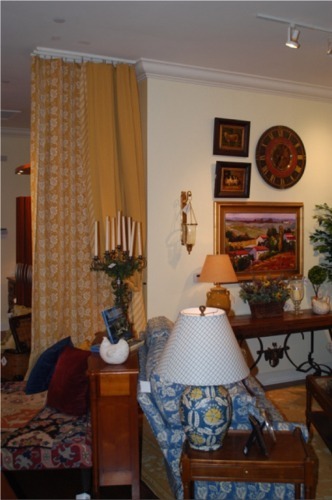 Decorative curtain panels are hung in the stores’ front windows, adding varied colors and textures with the intent on attracting window shoppers. They also serve as a colorful backdrop for the array of items displayed inside these stores. It also provides the stores with privacy as needed since the curtains can be fully drawn as well. The curtain tracks are also being used to create a display of curtain panels within the store. By mounting multiple shorter segments of curtain track in parallel, these coordinated fabric panels are used to enhance the décor, exhibit the fabrics of the panels themselves, and deliver an overall color palette to compliment the items presented in the store. There are two interesting observations we would like to share about these particular installations. Because of the color scheme of these stores, it was important to the designers that these tracks be white. The 3120 curtain track comes in silver or black finishes, so these tracks were primed and painted during installation. This has worked well for these installations, but we would caution customers to test the desired paint on the back side of a track to be sure it adheres properly to the anodized finish of any aluminum curtain tracks before fully painting them. Second, the curtain panels that are hung with this drapery hardware feature button holes across the top in lieu of grommets. This is a unique means of avoiding the appearance of grommets while still allowing for the use of J shaped curtain hooks instead of traditional drapery pin hooks. We have been pleased with this ongoing retailer relationship, and look forward to supporting their grow efforts moving forward. If you find yourself in a Pierre Deux store, take a look around and see if you can spot the curtain tracks in use…it may inspire you for a creative application of your own.